Puppet shows of Jaipur are very famous and these shows are incomplete without songs. Puppets made of wood are colored and decorated in the Rajasthani style to make them beautiful and colorful. Puppet shows are displayed in traditional style and the characters vary in several numbers. Traditional musical instruments like ghungroo, Sarangi and ektara shows a real mix of Royal Rajasthan. Puppet dance is one of the most attractive things in Jaipur. The dance by the puppets is done on traditional way which shows history, myths, legend with the background music and narrates. The handmade puppets in Jaipur are coming from the ancient period. It is also known as kathputli dance. Kath means wooden and putli means puppets, so kathputli basically means wooden puppets. Puppet shows are mainly performed by Bhat Community. Puppet dance is the most popular form of folk entertainment in Jaipur. We can also see the puppet shows near Hawa Mahal. Without puppet shows no village fair, no religious festivals and no social gatherings are completed. Puppet shows represent the traditional knowledge, wisdom and some social activities in it. Also they show the oral history of the region. Earlier puppet shows were only performed in Royal courts but now it has become very common. Some puppets are also made in different pieces like face, arm, body and legs which are totally carved with wood. One, who make puppets, fix the different parts loosely with each other so that movement can be done easily. One string is also tied in every piece and one part of that string is looped into the puppeteers hand and fingers so that movement can be done accordingly. The puppet dresses are made up of old printed fabrics and hands of these puppets are simply made by using cotton or by stuffing rags into the sleeves of the dresses. Eyes of the puppets are also made very beautifully. Sparkling eyes and beautiful dresses are very eye catching. Apart from folk entertainment, nowadays puppets are also used in interior decoration of home. The decoration of the room seems to be incomplete without puppets placed in the room. The puppets are available in the markets of Jaipur. Puppets can also be given in the form of gifts to your friends. These puppets are very famous in all the countries and also become a shopper’s delight for tourists. movements of puppets. These shows are enjoyed by all age group people. The puppet show usually ends in an hour. Some of the popular couples in puppet shows are Moomal Mahendra, Dhola Maru etc. 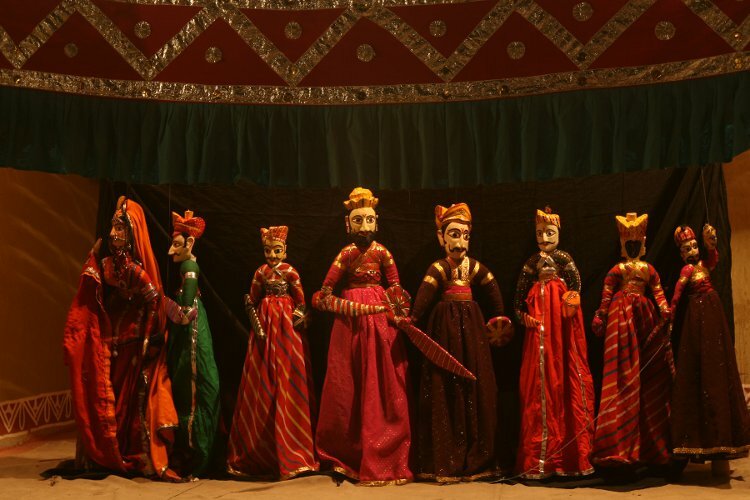 the string of puppet shows is related to the age of Raja Vikramaditya of Ujjain whose Throne was decorated by 32 dolls and was known as Simhasan Battisi. It is said that the first show of puppet was done with 32 puppets and was based on life and achievements of King Vikramaditya and for years onwards, his decedents performed the same show for the royal families and received great honor. In the puppet shows of Jaipur, there are a number of wooden dummy dolls which are beautifully dressed up in bright colors and are attached with strings that the puppeteer uses to move them around. With the help of a cot there is a miniature stage which is set for the performance.